Wow! I really drew a blank on this one. You’d think with the decades that I’ve researched my ancestors I’d easily have found an unusual record. Part of the problem is that my ancestors jump the pond so recently, so most of my records are foreign baptismal, marriage, and death records. I thought this was kind of unusual. This was something that my dad saves. I got a kick out of the fact that he held onto it for so many years. 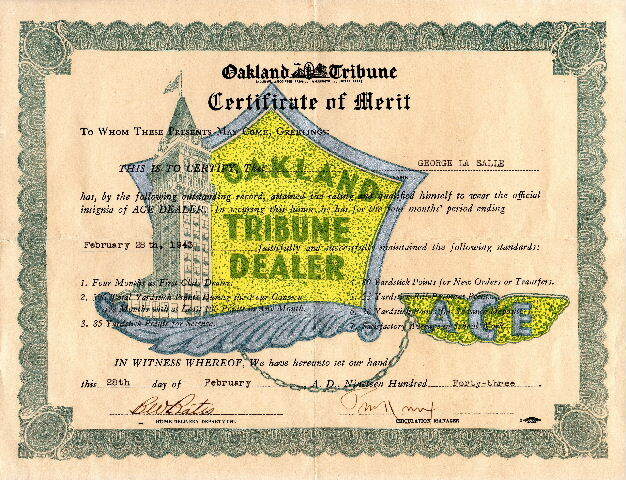 My dad was a dealer for the Oakland Tribune Newspaper which served Oakland, Alameda County, California (still does). That means he was a paperboy. An ACE one. It says so on the certificate. The certificate was issued 28 February 1943. My dad was one month shy of his 19th birthday. And, of course, they spelled his last name wrong. I found out with a web search that they also had a ceremony and inner for those earning certificates. Sounds like it was a pretty big deal to me. It was the last achievement that caught my eye. It states that my dad met the satisfactory average in school work. This is somewhat surprising to see. My dad left school at the age of 18 having only made it through his Freshman year. He was held back more than once and did not like school at all. According to my dad, he was not a good student. He hated reading and hated schoolwork. His parents kept him in school until the mandatory age limit was reached, then he left. He was already working as a paperboy and for a bicycle shop. He went to work full-time for Kilpatrick’s bakery. I told this story in “The Truth Lies Somewhere in Between” about how we all knew my dad left after 9th grade, but we did not know he was 18 at the time. Today, there are no paperboys, at least not in California. Long gone are the days when a 12 year old on a bicycle would throw your newspaper on the roof of the house. They no longer come around with their little bill book and tear off a little paper stub for your records. Now the paper is delivered by adults in cars who barely get your newspaper on the sidewalk. They no longer come around to collect the monthly bill and there are no more little paper receipt stubs. So, there you have it. My dad was one crackerjack paperboy. Thank goodness my dad was a saver. There are so many things I would not have known about him had he not stuffed papers into an old shoebox.